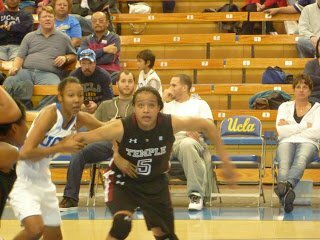 UCLA had to work hard today to put away the Temple Owls. Outside of the Notre Dame upset almost two weeks ago, this was the Bruins’ toughest test of the season so far. Temple isn’t a big wide team – they’re a tall, fit and fast team with superior strength and conditioning. They played relentless defense and are probably used to running other teams into the ground. They ran a stifling zone defense that forced UCLA to take shots at first, because they couldn’t get into the paint. It took a while for the Bruins to make the adjustment and find ways to attack the zone. 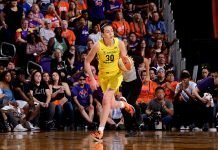 Southern California’s own Kristen McCarthy – who played for former hoops power house Bishop Amat – had five consecutive three-pointers in the first half for the Owls. This helped her team stay in the lead until literally the last second of the period, when Bruin guard Darxia Morris hit an improbable shot to tie the score at 35. 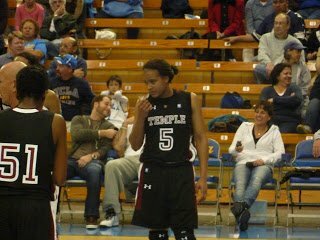 Temple began the second half on a run, and maintained a five-point lead until UCLA went on its own 13-0 run. But the Owls charged back, and it wasn’t until a Jasmine Dixon putback with 8:35 to go that the Bruins took the lead for good. UCLA stepped up its defense, which included a full-court press, and that seemed to cool Temple down. McCarthy lead all scorers with 22 points, and her teammate BJ Williams had 12. Morris and Markel Walker each had 15 points for the Bruins, and Rebekah Gardner added 14. Check out my game action shots HERE. They turned out well today. Southern Cali’s own Kristen McCarthy had a big crowd on hand for her today at Pauley Pavilion. Here, she lines up for a free throw in the second half. McCarthy, a junior forward, lead all scorers with 22 points, and she also had nine rebounds. OK, Allison Taka fans, she was at Pauley today taking in the action (seen here talking to a friend at a timeout). I’m not sure why you search for her on my site…..I know you do because the stats tell me she’s almost always one of the top 10 terms you punch in before you come here. I never wrote about Taka much; she was a bench player, and didn’t play much at all last year. So I’m a little mystified why you’re always looking for Taka stuff here. But I thought I’d give you a picture since you’re so dilligent. Now if her name keeps popping up, there will be a reason for it. I liked the fact that UCLA had to work against Temple. The issue for me was they did not work for the entire game. I personally felt that had UCLA given the effort they did in the last 10 minutes, it would not have been a close game. I am waiting for the Bruins to realize they are not a half court team. The spent a lot of time dribbling and standing around. If they can't become a 40 minutes team (okay I will take 35) they are gonna lose some games that they probably should win. 3rd, if Temple didn't knock the ball out). I would like to see Lemberger get some more minutes and Costa sees the court well. So far this season I am most impressed with Nyingifa, her game is on the money defensively and she is a pretty consistent shooter. i'm so happy to see nikki and the team picking up these hard-fought wins. it bodes well for the future. although i pledge no allegiance to any particular college team, i'm always happy to see an up-and-comer doing well. and that includes the coach, too.